The stock market movements of the last two weeks are puzzling. Take the China explanation. A collapse of growth in China would indeed be a world-changing event. But there is just no evidence of such a collapse. At most, there is suggestive evidence of a mild slowdown, and even that is far from certain. The mechanical effects of such a mild decrease on the US economy should – by all accounts, and all the models we have – be limited. Trade channels are limited (US exports to China represent less than 2% of GDP), and so are financial linkages. The main effect of a slowdown in China would be through lower commodity prices, which should help rather than hurt the US. Take the oil price explanation. It is even more puzzling. Traditionally, it was taken for granted that a decrease in the price of oil was good news for oil-importing countries such as the US. Consumers, with more money to spend, would increase consumption and increase output. Energy-using firms, with lower cost of production, would increase investment. We learned in the last year that, in the short run, the adverse effect on investment of energy-producing firms could come quickly and temporarily slow down the effect, but this surely does not undo the general conclusion. Yet the headlines are now about low oil prices leading to low stock prices. I can think of two potential explanations, neither of them convincing. • First, that very low prices lead to such serious problems for oil producers that this will end up affecting the US and dominating the scene. I have no doubt that some countries and some companies will indeed be in serious trouble; indeed, some already are. I can also think of ways in which low oil prices also change the geopolitics of the Middle East, with uncertain effects on oil prices. I find it difficult to think that these will dominate the direct real income effects for US consumers. • Second, that the low prices reflect a yet unmeasured decrease in world growth – a decrease much larger than is apparent in other hard data – and that the price of oil, like the celebrated canary in the coal mine, is telling us something about the state of the world economy that other data do not. There is no historical evidence that the price of oil plays such a role. But suppose, for the sake of argument, that, indeed, the low price told us that China is really slowing down. (The fact that non-oil commodity prices, for which China plays a bigger role than for oil, have decreased much less than oil does not support this interpretation.) Then, we would be back to the previous conundrum. It is hard to see how this could have such an effect on the US economy, and in turn on the US stock market. Another variation on the theme, which has been raised in some columns, is that the low oil price reflects a slowdown in the US far beyond what the other current data are telling us. There is zero evidence that this is the case. I think the explanation is largely elsewhere. • I believe that to a large extent, herding is at play. If other investors sell, it must be because they know something you do not know. Thus, you should sell, and you do, and so down go stock prices. Why now? Perhaps because we have entered a period of higher uncertainty. The world economy, at the start of 2016, is a genuinely confusing place. Political uncertainty at home and abroad, geopolitical uncertainty, are both high. The Fed has entered a new regime. The ability of the Chinese government to control its economy is in question. In that environment, in the stock market just as in the Presidential election campaign, it is easier for the bears to win the argument, for stock markets to fall, and, on the political front, for fear mongers to gain popularity. So how much should we worry? This is where economics stops giving an answer. Or, more specifically, where it gives the dreaded two-handed answer. • If it becomes clear within a few days or a few weeks that fundamentals are in fact not so bad, stock prices will recover, just as they did last summer, and this will be seen as a hiccup. • If, however, the stock market slump lasts longer or gets worse, it can become self-fulfilling. Low stock prices lasting for long lead to lower consumption, lower demand, and, potentially, to a recession. The ability of the Fed, fresh out of the zero lower bound, to counteract a slowdown in demand remains limited. One has to hope for the first scenario, but worry about the second. Editor’s Note: This was first posted on the Peterson Institute for International Economics’ RealTime Economic Issues Watch on 17 January 2016. 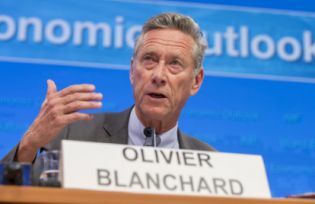 Olivier Blanchard is the Fred Bergsten Senior Fellow at the Peterson Institute and Robert Solow Professor of Economics Emeritus at MIT. He spent most of his career at MIT, but moved to Washington in 2008 to be the IMF’s Chief Economist (Economic Counsellor and Director, Research Department), a post he retired from in 2015. His research interests are in macroeconomics, including a wide set of issues that range from the role of monetary policy to the nature of speculative bubbles, to the nature of the labour market and the determinants of unemployment, to transition in former communist countries, to the global financial crisis. He is the author of many books and articles, including two textbooks in macroeconomics, one at the graduate level with Stanley Fischer and one at the undergraduate level. He is a past chair of the MIT economics department, a fellow and past council member of the Econometric Society, a past vice president of the American Economic Association, and a member of the American Academy of Sciences.